CommerceSuite is the integration of our shopping cart software and "View" web catalog along with the simplicity of browser-based setup and administration. Instant reports with eye-popping interactive, flash-based, business graphics keep you up-to-date and in touch with your products and customers. CommerceSuite is easy for your customers to use. It presents an easy-to-navigate catalog of your products with pages you customize to your preferences along with full-featured, yet simple shopping cart software. The shopping cart software supports credit card processors including Authorizenet, Innovative Merchant Solutions, TransFirst, and more for easy payment acceptance. Combining sophisticated operation, powerful, scalable item management, and seamless shopping cart integration, CommerceSuite software enables you to jump-start your online presence with the basics then grow as your needs change. CommerceSuite includes features found only in higher-priced commerce software. Start with the Business Intelligence Dashboard. Tracking your online business is taken to the next level with key indicators, flash-based business graphics, drill-down sales reporing, and a library of additional reports. 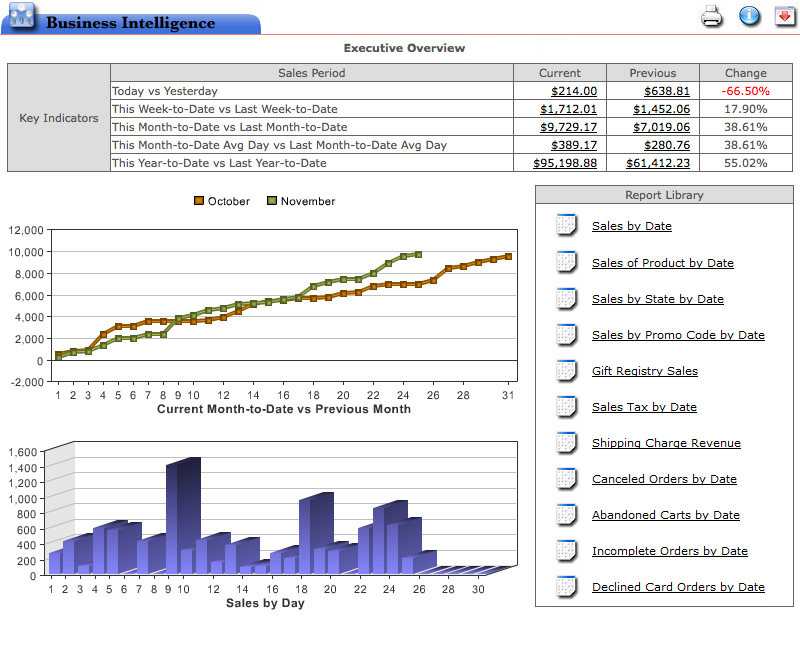 See an example of the Business Intelligence Dashboard. As a customer is shopping on your site, they want to know that their personal information is secure. Our secure shopping cart software uses industry standard 128-bit SSL encryption security. SSL guarantees security by creating a secure, encrypted channel for data exchange between the user's browser and our commerce servers. In addition, we never store credit card data, but pass it only via a secure channel to the credit card processing gateways (Authorize.Net, First Data, Global Payments, Innovative Merchant Solutions, Nova, Paymentech, PayPal Website Payments Standard, Sage Payment Solutions, and more). If you use CommerceSuite's shopping cart software, you will never have to worry about your customers' data security. One of the most overlooked aspects of any commerce website is the ability for shoppers to find the items they want to buy. CommerceSuite's advanced Smart Search software provides an intuitive and easy-to-manage system that will help your customers find what they want so that you sell more. Using its predictive engine, it can be configured to present relevant suggestions based on your customers' search habits. With both a TypeAhead feature and a drop-down list of additional suggestions, Smart Search can present relevant terms to your customers as they type. An accurate search will present shoppers with items most likely to interest them. 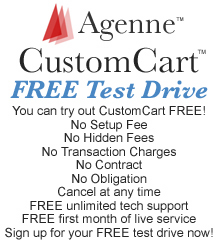 Do you need easy-to-setup shopping cart software? Simple HTML forms and links are all that is required to add CommmerceSuite to your website. CommerceSuite's code generators will automatically create the code that you need to copy and paste into the HTML pages of your site. In addition, if your web site uses a dynamic, database-driven product catalog system using a language such as ASP, PHP, ColdFusion, .NET or another dynamic web language, our support team can supply code that you can build in to your pages that will generate the necessary HTML forms automatically. One of the most important aspects of CommerceSuite's integration with your business web site is the ability to customize the shopping cart and catalog sofware to provide a seamless shopping experience for your customers. This customization capability includes custom HTML headers, custom HTML footers, custom background wallpaper, and most importantly, the ability to affect the look of every shopping cart and catalog page using cascading style sheets. These customzation features are very easy to setup and our FREE and UNLIMITED technical support means that we'll be there to help you customize the shopping cart software to match your website. Want to learn more about the shopping cart software's advanced feature set? Click to visit the shopping cart software feature list. Or maybe you want more information about View's advanced feature set. Click to visit View's feature list.